The Secret Diary of Steve Jobs : Mr. Wizard, get me the hell out of here! Mr. Wizard, get me the hell out of here! No, that is not Jonathan Schwartz praying to be teleported out of Sun and back to the freetard mothership. 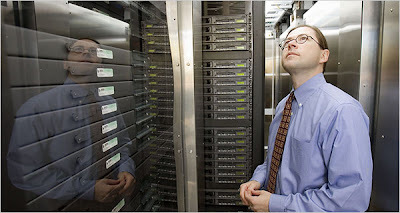 In fact it’s Jonathan admiring one of his previous crazy ideas, the data center in a box. (They lured him in with the promise of getting his picture in the New York Times. Clever MLP managed to slip out before they could lock him in.) Anyway now he’s on to something even wackier. Gizmodo reports here that Sun and Samsung are working on a Java-based iPhone clone. What can I say? These guys want to fight us in the consumer space? Really? Sigh. Whatever. Bring it on, I guess. But honestly it’s not even going to be fun crushing these guys. They’re just so sad these days. I mean, is there anything MLP won’t try? They had the boxed-up data center, which came with or without the CEO-inside option. They had the Niagara chip. They had Linux. They had open-but-not-really-open Solaris. They had open-but-not-really-open Java. Open-but-not-really-open Star Office. They had free software to get you to buy hardware. They had free hardware to get you to buy software. They had GPLv3 but then not GPLv3. They had a new core focus on storage. They had a new ticker symbol. Now a phone. With Samsung. The place is like some wacky science lab run amok. They make Google look disciplined and well-managed. And that’s saying something. Do you ever get the sense that MLP just wishes someone would beam him up out of there? I know I do. My take is McNealy is just sitting back watching this kid scrambling around like a cat on an ice rink, and loving every minute of it.